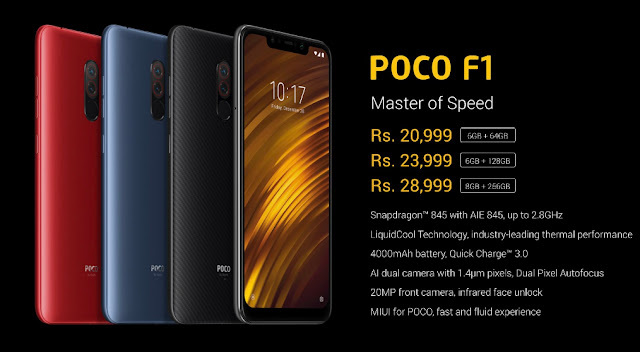 Xiaomi Poco F1 was launched today in India. This Flipkart Exclusive Smartphone has Qualcomm Snapdragon 845 SOC Chipset Processor. The company had already informed about some of the features of this smartphone via Twitter. The company is going to enter the premium segment through this smartphone. 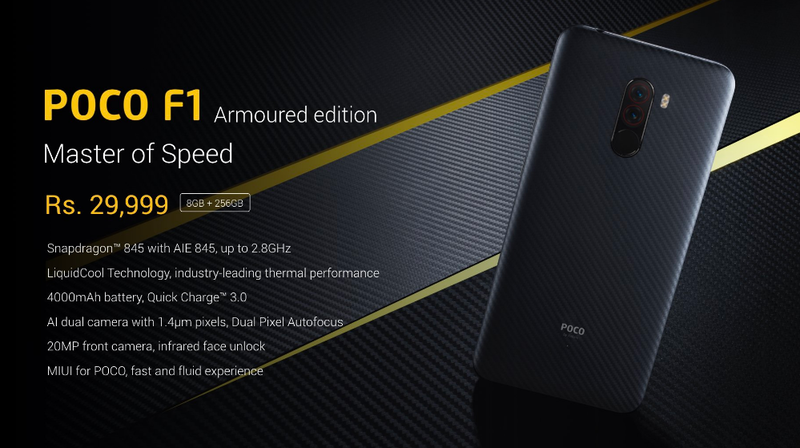 Xiaomi Poco F1 has a 10nm Qualcomm Snapdragon 845 processor. The speed of its processor is 2.8 GHz. Water cooling technology has been used with the processor, which keeps the phone processor cool. The impact of the phone is affected due to its performance. The phone has Qualcomm Adreno 630 GPU. 4G + strong networks have been supported in the phone. Powerful 4,000 mAh battery is given in the phone. According to the company's claim, the battery life of the phone is great. You can play games continuously for 6 hours. Also 30 hours 45 minutes of calling time. The phone has a 20-megapixel selfie camera with an infrared camera and light for face unlock. The dual rear camera is given in the back of the phone. The phone's primary rear camera has been given the 12 megapixel Sony IMX363 sensor. The secondary rear camera is given 5 megapixels. Kevlar fiber has been used in the phone body. The phone is available in three memory variants 6GB + 64GB, 6GB + 128GB and 8GB + 256GB memory variants. Memory of the phone can be increased through the microSD card. Launched with the phone hybrid SIM slot. That is, you can either use dual SIM or use a SIM card and a 256 GB memory card. The phone has a brand new MIUI that supports Poco Launcher. The phone comes with Android OSO 8.1 operating system. At the end of the year, there will be an Android 9.0 update. Several unique features have been provided in the phone's interface. In which you can also hide the application according to your own. Apart from this, the app can search by color. Plus you can also grouping apps. Fingerprint sensor in the phone is given in the back panel of the phone. The phone has been launched in three color variants Graphite Black, Steel Blue and Ross Red. The phone's 6GB + 64GB RAM variant costs Rs 20,999. The price of the 6GB + 128GB memory variant is Rs. 23,999 and the 8GB + 256GB memory variant is priced at Rs. 28,999. The phone is launched with another Armored Edition, which costs Rs 29,999. This edition has 8GB + 256GB RAM. The company has also launched some accessories along with the phone. An instant cashback of Rs 1,000 will be given to the HDFC card users with the phone. Apart from this, Reliance Geo users will be given a cashback of Rs. 8,000 and high speed data of 6TB. This smartphone will be the direct competitor to India's most popular premium smartphone OnePlus 6T.